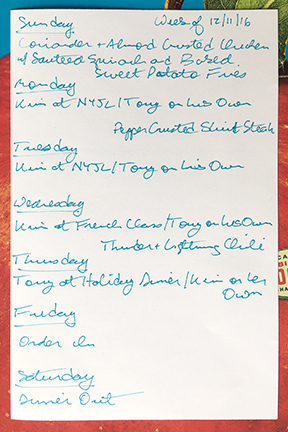 We both have a lot planned this week–Kim has two New York Junior League meetings and her French class, Tony has two holiday parties Thursday night, and we have plans with our good friends Lynee, Sandy and Steve for Saturday night–so we are going to try to do quite a bit of cooking on Sunday to carry us through the week. First up is Sunday dinner, when we’ll recycle a recipe that we didn’t get to last week: Coriander-and-Almond-Crusted Chicken Legs. We’ll have this with sautéed spinach and Baked Sweet Potato “Fries”. We made the sweet potatoes for Thanksgiving and they were fantastic, so this is a dish we’ll keep in rotation throughout the winter. We prepped the potatoes as chunks rather than fries, but this hardly seems to affect the taste! Since the oven will be on for the chicken legs, of which we’re only making two servings, we’ll also make some chicken thighs so that we can have a little variety of dinner during the week. We’re going to keep things simple and rely on a jar of harissa sauce to flavor the chicken thighs. We’ll make some cous cous to go with the them whenever we decide to have the chicken. The oven will be full of chicken, but the stove top will be clear, so Tony is going to make his not yet world-famous (we’re more at the “apartment-famous” stage) “Thunder and Lightning Chili”, which is an adaptation of Robert Irvine’s Lightning Chili and Rice recipe. Rather than relying solely on ground beef as the meat in the chili, Tony uses a 50/50 mix of ground beef and ground short ribs to add some depth of flavor. He also uses a mix of ancho and chipotle chili powder instead of regular chili powder to spice things up a bit. Time permitting, he’s also going to make some corn muffins. The chili will make for some fun dinners and lunches this week, as will the Pepper-Crusted Steak left over from last week. We’ll probably order in on Friday night–either sushi or Indian to balance out what will otherwise be a meat-heavy week. Our Saturday dinner plans haven’t come together yet, but we will no doubt have a good time!